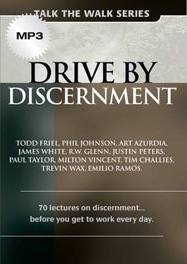 Drive By Discernment is designed to sharpen your skill to help you separate the true from the almost true. Who, what and how to judge? Can we judge the way people do church? What are the modern day assaults on the Gospel?Never in the history of the world have false teachers had a greater ability to slyly introduce their ear-tickling teachings. Unfortunately, the good old days are gone when heretics would proudly proclaim, “I don’t believe what you do!” Instead, they seductively slip almost true teachings alongside of the true. When does a false teaching become heresy? How do I treat a brother who does not agree about a particular false teacher? What is the role of the church in defending the truth?More than that, you will learn how to discern yourself to make sure that you never fall into a theological ditch.These lectures are the cream from the “Psalm 119 Conferences”.